Best Indie Games From E3 2017 | Nerd Much? E3 2017 certainly was less awe-inspiring than last year. There were very few brand new titles and IPs announced, much to the disappointment of many gamers. But, it also seemed to help the little guys stand out more. 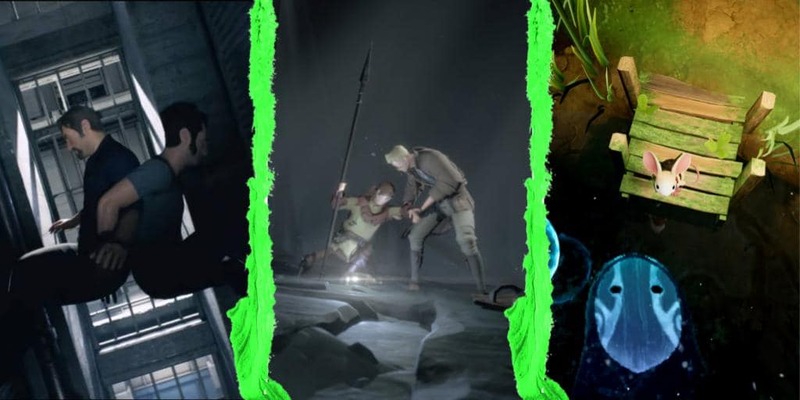 Even the PC Gaming show was about 10% less dry than last year due to a few more interesting indie games — only two of which were interesting enough to make this list of the best indie games at e3 2017, unfortunately. Nonetheless, here is a list of the underdogs that we think deserve a spot on our wishlists. All of these were picked for standing out in some unique way — a way that could not be described by simply comparing it to another game. For example, Ylands, an honorable mention from the PC Gaming show, could be described as the slightly upgraded version of Minecraft. Whereas the ones on this list are a little more complicated. A Way Out is an action-adventure game published by EA and directed by the same fellow who directed Brothers: A Tale of Two Sons, Josef Fares. But this isn’t your run of the mill adventure; A Way Out stands out because of its gameplay mechanics. There is no single player. This game must be played by two people, either online or local. It’s a split-screen couch co-op only game that hasn’t existed since Portal. Not only that, A Way Out is so much more than a puzzle game. This is a story about two best friends as they go through everything together, from escaping prison to reconciling with their families. The Last Night is a game that caught everyone’s attention – until they met the game’s designer Tom Soret. His transgressions are numerous and I would be the first to speak out against his actions. But, that doesn’t mean what I think is a toxic person can’t create amazing art. Otherwise, people like Frank Miller or Mel Gibson wouldn’t have influenced the world of cinema as much as they have. One is notorious for being anti-semitic and hot-tempered, the other has been accused of bordering on sociopathic — yet their works and methods are still considered quite innovative. Thus, I’ve decided to give The Last Night a chance. This game centers around the concept of finding a purpose in life without the usual defining traits like creativity or a career. People in The Last Night find purpose in what they consume. The main character, Charlie, does not have the luxury of “plugging in” as so many of his fellow humans do. Instead, the game follows Charlie’s mission to belong in the world, even if it is not considered the most conventional of ways. A sequel to Lucky’s Tale, which came out last year, Super Lucky’s Tale is a 3D platformer for all ages. It’s light, fun, and not without the humor usually found in Rare games. The game follows a little fox by the name of Lucky, as he finds the strength to help his sister rescue the Book of Ages from the evil and mysterious villain named Jinx. Admittedly, after enjoying Skylar & Plux so much, I immediately took a liking to this one, too. Super Lucky’s Tale looks as equally fun and entertaining as the Megaman-inspired Skylar & Plux. After Ori & the Blind Forest broke the hearts of gamers around the world, Moon Studios has to go and do it again with a sequel, which we now know is named Ori and the Will of the Wisps. Even the trailer managed to bring a few sniffles. This time around, it seems the forest has changed a great deal. Not only are there new creatures to either fight or befriend, but devastation has also come to the forest once again. The tree, so holy and sacred, has been set aflame. The terrifying owl is now apparently dead, leaving behind a baby — a small owl that finds comfort in Ori’s arms as he looks upon an effigy of his parents. Beautiful art, music, and concept will keep Moon’s games on indie lists for years to come. I have no doubt this sequel will be just as enjoyable as the first. From the same studio responsible for the Don’t Starve series, comes Griftlands. This game is an RPG where you play the ultimate mercenary. Money, friends, materials, it’s all up for debate if care for the right price. This game struck me with its art style. Sure it’s a little stuff, but there is nothing quite like a video game drawn like a comic book. Be a hero or a villain, get rich or die trying – who doesn’t like sandbox options like that? I didn’t think a VR title would make it to this list, but I’m a sucker for beautiful landscapes and adorable main characters. Moss has both in spades, following the adventures of a small mouse named Quill. Throughout the game, the player helps Quill overcome obstacles like puzzles through either communication or physically removing objects in the environment. Thus far, it seems Moss is a single player game, but it sounds as though it would make a great co-op game too —at least online; I imagine VR is a tricky otherwise. I look forward to seeing more of this gorgeous game as it is the indie game I’ve been waiting for to come to VR. From developer Andrew Shouldice, comes Tunic, an action adventure game in an art style not unlike RiME. This 3D platformer has been heavily compared to Zelda, and I cannot deny the obvious inspirations. Tunic is the one exception to my rule of uniqueness. At the moment, Tunic seems to be another Zelda look-alike that only stands out because of its art style. Also, most Zelda games are great titles, so why not? We have yet to see if Tunic‘s gameplay will stand out too, or if breakable pots and cut grass will define it. Seriously, how many times is this game going to be on a “best indies” list before it comes out. Only a few more months for its release, hopefully, as this E3 finally showed us a Cuphead release date. Cuphead is a 2D side-scrolling platformer with an art style that takes cues from 1930s cartoons. I think it’s easy to say that most gamers have been looking forward to this very unique title for a few years now, so it should be no surprise to see it on this list of the best indie games of E3 2017. Ashen, another Xbox console exclusive, is a game inspired by Cormac McCarthy’s novel, The Road. The latter is a novel focused on the journey and relationship between father and son in a world ruined by apocalyptic forces. There is no happy ending, but rather a study on what desperation for survival can do to one of the most precious relationships in our Western society. Ashen takes this world and throws a Dark Souls spin on it, effectively making it even more dreary. The player is to take an NPC (or friend via online multiplayer, though the details are not clear) through the world in order to eventually defeat the Gnaw. The point, as far as I can tell, is to “bring light” to humankind so that they may longer struggle to survive against the many creatures darkness brings. 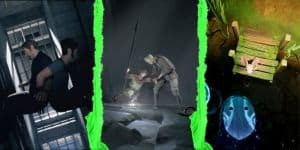 Check out more upcoming games here, and stay tuned to Nerdmuch.com for noteworthy indie game news and analysis.